About four years ago I had my interview for a chemical health social work position at Washington County. I debated whether or not I should mention that I am in recovery from drugs and alcohol. 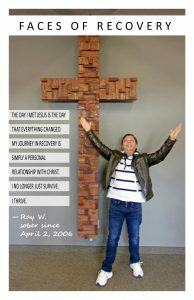 Previously, I was working as a counselor in treatment centers where the majority of my coworkers were also in recovery. They weren’t just in recovery, they were open about their recovery. It was something to be proud of and celebrated. I entered the interview room as stiff as a board because I was so scared that if I moved a certain way my tattoos would be revealed. When asked what brought me into the chemical health field and why I wanted to work at the County, I felt my eyes begin to water. I couldn’t help but think about how just six years ago I was waiting to complete my Rule 25 Assessment and get into treatment. Now here I was, interviewing for a job where I would be giving the same type of help that I received at the beginning of my journey into recovery. As a counselor, I always admired the County workers. I knew that someday I wanted to be at the County. When I was offered the position, I bawled my eyes out. I felt so incredibly grateful. On my first day of work I mentioned to a coworker that I was in recovery. Her response? “How did you pass the background check?” I paused for a second, but awkwardly laughed it off because yes, it was a legitimate concern. That didn’t stop me from talking about recovery, but I quickly realized that talking about my sobriety seemed to make my coworkers uncomfortable. “We don’t really talk about that here,” I was told. Well, why not? 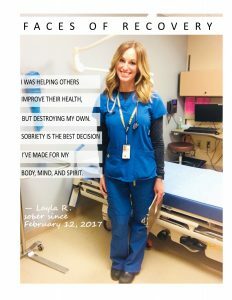 It shouldn’t matter if I’m working at a treatment center or the County, both can be places where recovery can be openly discussed and celebrated. In a 2014 study by Johns Hopkins University, researchers found that Americans were more likely to view people with substance use disorders more negatively than those with mental illnesses. 22 percent would be willing to work with someone with SUD. 62 percent would be willing to work with someone with mental illness. 64 percent believed employers should be able to deny employment to people with SUD. 25 percent believed employers should be able to deny employment to people with mental illness. 43 percent opposed giving individuals with SUD the same health insurance benefits as the rest of the public. 21 percent opposed giving those with mental illness the same health insurance benefits as the rest of the public. I’m sure all of us can say we have been affected by addiction in some way. According to a recent report by the Surgeon General, 21 million Americans struggle with SUD but only 1 in 10 ever receive treatment. The American Medical Association declared alcoholism a disease in 1956 and did the same for drug addictions in 1989. Despite this recognition, SUD remains one of the most stigmatized diseases. The behavioral symptoms of addiction are so baffling that it’s hard to understand and even harder not to have an opinion. Even among professionals, SUD doesn’t get the same respect that other chronic diseases do, such as diabetes and cancer. All too often treatment and services are discontinued due to the belief that someone hasn’t “hit rock bottom,” suffered enough consequences, tried hard enough, or “just isn’t ready.” How many other diseases would we treat that way? I have never seen another disease be subjected to so many people’s opinions. 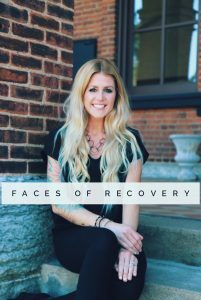 I knew I had to do something and that’s when I decided to create the Faces of Recovery posters. I selected 10 incredible people. Most of whom have been instrumental in my own recovery. 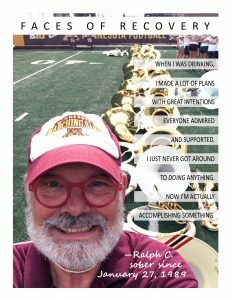 I wanted to showcase people doing what they love and thriving in recovery. 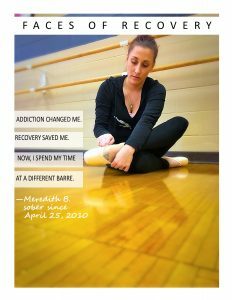 My goal is to change the way others view addiction by getting a glimpse into the stories of recovery. I want to help create a work environment that celebrates recovery. I also want to inspire people who are struggling that recovery is possible. Often times we see addiction publicized at its worst. 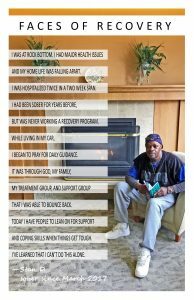 We don’t hear the stories of recovery. We’ve seen enough of the Faces of Meth posters to know that drugs are bad, but that doesn’t mean these are bad people. The truth is, “these people” are nurses, construction workers, social workers, attorneys, moms, dads, husbands, wives, children and friends. If I had to be judged forever by the things I did while actively addicted, I would have never recovered. The stigma of this disease keeps people sick and if we do recover, many of us are too ashamed to share our story, for fear of being judged. I easily could have shut down when I didn’t feel my recovery was accepted. Instead, I used it as an opportunity to educate. I put my story out there because I believe when we are vulnerable and share who we are, we have the ability to truly connect with people. Those uncomfortable conversations about my recovery have turned into acceptance and understanding. On May 20th I celebrated 9 years of sobriety. My coworkers invited me to lunch in honor of my sober birthday and we openly talked about recovery. I felt loved, accepted, and worthy and that’s the way it should be. 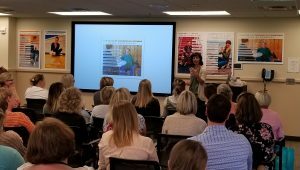 Kris Kelly from Minnesota Recovery Connection facilitates a Recovery Ambassador workshop for Washington County staff members. 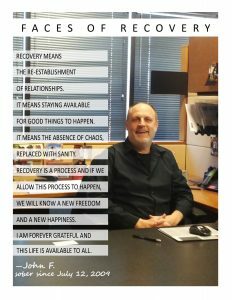 For Recovery Month I hosted an event where I was able to showcase my Faces of Recovery posters and educate over 100 of my coworkers about SUD and recovery. The response I have gotten from this project has been incredible. The emails and calls I’ve received from coworkers and the community have been so encouraging. 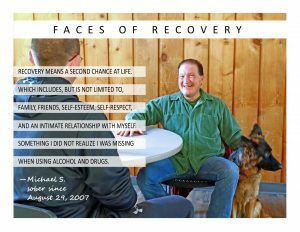 I plan to continue speaking about the Faces of Recovery and will add additional posters throughout the year. It’s not just about hanging up a poster. It’s about the story behind each one. It’s about talking openly about recovery and spreading hope. We learn from stories and we connect by stories. We all have a story to tell and we can help defeat the stigma by sharing it. 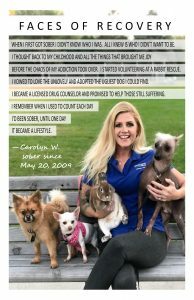 My name is Carolyn Wiger and I have been in recovery for 9 years. I have been in the Chemical Health field since 2010 and have been a Licensed Alcohol and Drug Counselor since 2012. As a counselor, I worked in both residential and outpatient treatment centers. Currently, I work at Washington County as a Social Worker. 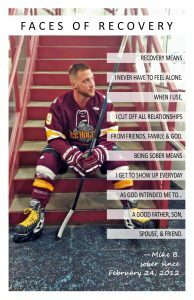 My personal struggles are what led me into this field and my recovery is what keeps me going today.